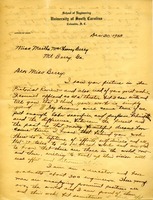 D. H. Mast sends a $10.00 donation to Martha Berry. He recommends that Berry require former students who are successful later in life be required to help maintain the school. 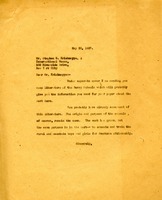 He states that "The Best Education is that which is worked for." 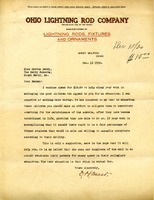 Rowe, Dean of the School of Engineering at the University of South Carolina, writes that he learned of Berry's work in the Pictorial Review. 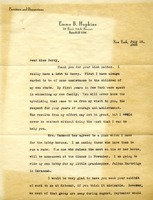 He enjoys his own work in higher education, but regrets that he did not take the opportunity to return to the countryside where he was born and do good work such as Berry does. 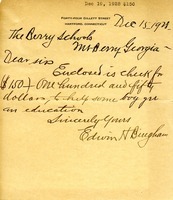 Edwin H. Bingham sent $150.00 to the Berry Schools to provide a boy with an education. 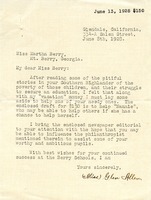 Barrett writes to ask Berry for information on her life and the Berry Schools because her class is studying the state of Georgia. Miss Glen Allen informed Martha Berry she was setting aside some money after hearing of Martha's stories in Southern Highlander about her children struggling to get an education. 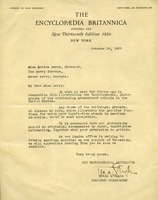 Tracy L'Engle of the Encyclopaedia Britannica asks Miss Berry for photographs of the schools for a section on outstanding mountaineer schools in the United States. 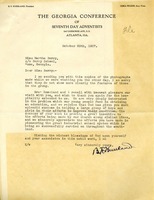 B.F. Kneeland, president of the Georgia Conference of Seventh Day Adventists, sends copies of photographs taken during a recent visit. He expresses the deep interest he and his wife have in education and in Berry's work. 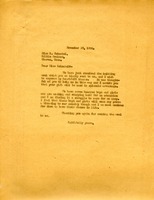 Mrs. Ralph B. Williams donates $150 as a scholarship for Eugene's education either in the current year or another year. 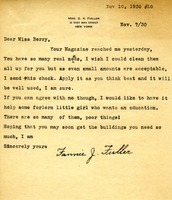 A thank you letter to Miss Schnabel in Sharon, Connecticut, thanking her for sending knitting wool to the boys and girls working towards gaining their education. 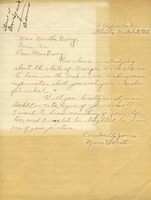 The letter is unsigned, but it is assumed it was written and sent by Martha Berry.